Nutritional problems are common in persons with dementia. Because the brain is involved in all aspects of eating, when parts of it are damaged by disease, a person can have trouble eating. Some may not want to eat and others may not be able to feed themselves. Some may even forget how to chew and swallow. When a person with dementia won’t—or can’t—eat, they don’t get the nutrition they need to stay healthy, comfortable and strong. A good diet is vital to a person’s health and well-being. 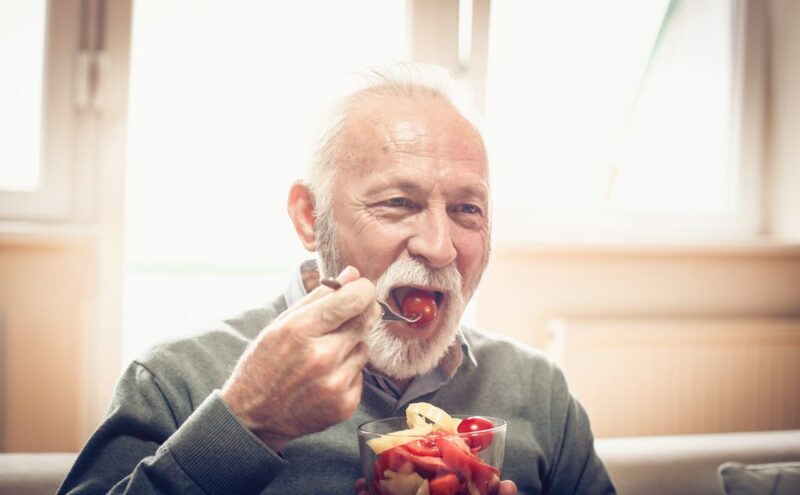 Individuals living with dementia may get distracted and lose interest in eating. It is important to encourage them to do so. Invite the person with dementia into or near the kitchen while foods are cooking—aroma is a powerful appetite stimulator. Design menus that are nutritious and incorporate all food groups. Limit the use of salt and sugar, but incorporate other spices and herbs to add flavor. Fruits, vegetables, nuts and fish have many beneficial attributes, including antioxidants and Omega-3 fatty acids that can help boost brain health. Be sure to include foods the individual has always liked. Make eating as easy as possible by organizing the food, plates, and utensils. Give only one food item at a time. A busy plate can be confusing. Try one course at a time, served on a single plate or in a single bowl. Use utensils that afford the person the best chance to have success at eating. For example, a spoon may be easier to use than a fork in terms of lifting food off the plate and up to the mouth. Consider using adaptive utensils, such as weighted cutlery, to assist a person with dementia in holding the fork or spoon independently. Pre-cut foods and finger foods are easiest to manage. Usually, if someone with late-stage dementia has difficulty speaking, they also have trouble swallowing. Pay special attention to help ensure they do not choke on their food or beverages. Feed them slowly, and make sure they have swallowed each bite before serving another. Keep a drink ready during meals to help wash down each bite. Ask the individual’s healthcare professional for advice on choosing foods that are best suited for someone who has trouble chewing. If a person with dementia has dentures, be sure they use their dentures during meals. There are even cook books designed to assist, including “I-Can’t-Chew Cookbook” by J. Randy Wilson.